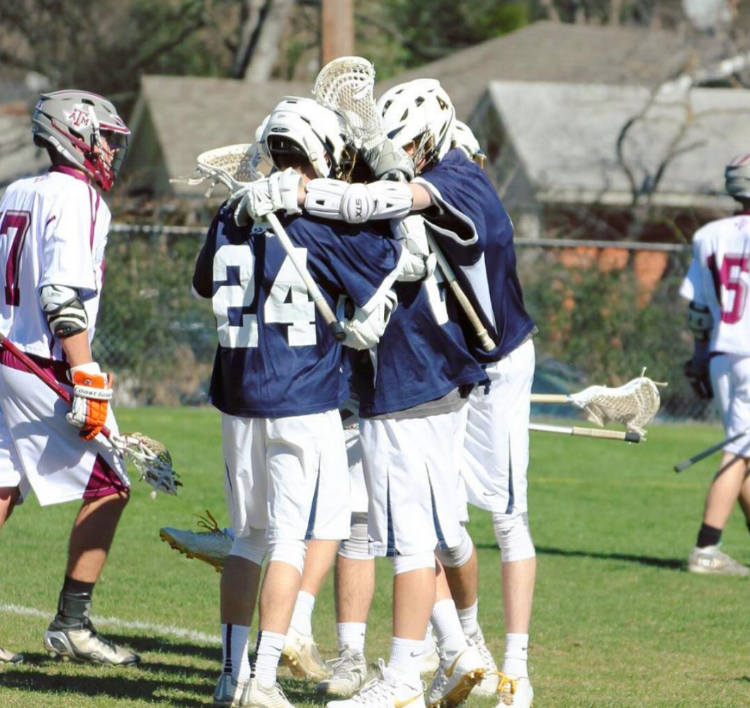 Andrew Stingi, JP Turco, and Anthony Fragapane celebrate after scoring. All three players will be returning for 2018, and were three of the four top scorers in the 2017 season. The St. Edward’s men’s lacrosse team looks to build on their 7-2 season with a strong schedule, determined leaders, and a new coaching staff. The HIlltoppers will look to turn some heads this season, as returning players still have a sour taste in their mouths after barely missing the conference tournament last year. This article is the first of a three part series, where we will highlight the upcoming season, the 2018 team, and our new coaching staff. The Hilltoppers will open up their high powered schedule taking on the Texas A&M Aggies and The North Texas Mean Green in back to back weekends. The Hilltoppers will open up at home against the Trinity Tigers on February 17th. This vengeful matchup will mean a lot to returning players, as this 10-12 loss in 2017 was part of the two loss season.that kept the Hilltoppers out of the playoffs. The team then will move on to preparing for homecoming weekend, as the Hilltoppers host Dallas Baptist on February 24th. This game will take place on the main athletic field at St. Edward’s University at 11:00. The day of homecoming festivities will include a tailgate, and an alumni get together. Further details to come, and all family, friends, and alumni are invited to attend. The Hilltoppers will travel next to San Antonio for a doubleheader weekend . Playing University of Texas-San Antonio on March 3rd, and Texas A&M- Corpus Christi on March 4th, this weekend will be a true test of the team’s depth of talent. Last year, the Hilltoppers defeated the LSA-South champs, UTSA, at home by a score of 10-13. The team looks forward to the high stakes matchup that always ends in a close score. New Orleans, Louisiana is the next destination for the program as they will spend a weekend of their spring break in the Big Easy taking on Tulane University, and volunteering in underprivileged neighborhoods in the city. The Hilltoppers take on the Green Wave on Sunday, March 11. The Hilltoppers will wrap up their regular season with a final trip with back to back weekends of conference play. Taking on University of the Incarnate Word on March 24, and ending the season with Baylor at home on April 8th. The April 8th matchup against Baylor will be highly anticipated, as last year the Hilltoppers fell to Baylor in a heartbreaker, allowing Baylor to move on to the Lone Star Alliance playoffs and ending the Hilltoppers season. The Hilltoppers will be seeking revenge against their newly inducted DII opponent, and hopefully will stretch their undefeated home record to two whole seasons. Please consider donating to St. Edward's Men's Lacrosse as we look to build on our most successful season in program history. The click the button below to donate to help offset our $20,000 in expenses for 2018.